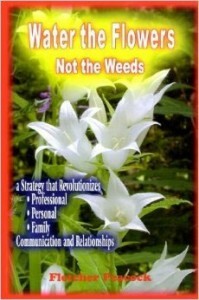 Book Review: Water The Flowers, Not The Weeds. “No matter what the other person does, it is his/her unique way of cooperating.” This is just one of the gems in this book that supports me in re-framing my thoughts and judgments in such a way as to be more able to clarify needs and release the struggle and conflict. Fletcher Peacock defines different generations of communication. In the first generation, the belief is that it is necessary to understand problems and causes of problems. Years may be spent consulting experts who focus on the problem, defining, labeling, and even pathologizing the person with the problem. Now what about the notion that “No matter what the other person does, it is his/her unique way of cooperating.” The author defines 3 styles of cooperation. The ‘visitor’ is someone who does not perceive a problem and is not motivated to change. The ‘complainant’ is someone who recognizes a problem but feels powerless to change. The ‘customer’ is someone who is ready to change or take action. A person can move from one style to another and back in the same conversation. If we talk to a visitor as if s/he were a customer, we are likely to experience and judge the person as lacking in motivation and willingness to cooperate. If we try to reason, explain, or convince the visitor to see our point of view, we are likely to engage them in a power struggle. The author states that to convince is a military metaphor – we are trying to conquer the present truth of the other person with our superior truth. Rather than respecting the other person’s point of view, or as Marshall has said, seeing what the person is saying yes to when they are saying no to our request, the other person may perceive our reasons and explanations as attacking and devaluing their point of view, and escalating conflict. By recognizing what style of cooperation the other person is displaying, we can altar our style of interaction, and increase the chances for mutually satisfying interactions. The ideas in this book are not new – the material is synthesized from many models, including Marshall Rosenberg’s Nonviolent Communication, Milton Erickson’s model of therapeutic communication, and John Walter’s Solution Focused Therapy. I find the author’s presentation of stories, metaphors, examples, and ideas to be clear, easy to understand, and practical. In reading and reflecting on this book, I was able to deepen my own communication and problem solving skills, and to re-frame and release resentment over a situation that has plagued me for several months. This book is out of print in the U.S., but is available from used book stores, from the author, or from Terri Harmon. Fletcher Peacock is planning a follow-up book soon.